Recently, my husband and myself have embarked on a quest to potty train our 2 1/2 year old son. Any parent who is currently undertaking the same task or recently made this journey knows that it is both exciting and trying. It’s great to see your little one learning and taking on new responsibilities but at least in my child’s case, they aren’t always eager to grow up. In fact, my son has not had any real interest in potty training up to this point, and unfortunately, he’s still not overly excited about the prospect of using his “big boy” potty. To get him motivated, I decided to call in reinforcements. Unfortunately, the promise of sweets, toys, and mommy doing her “happy dance” was not incentive enough. Thus I called in the big guns: this cute free potty chart. Download your Free Potty Chart Printable now! For more fun free printables, follow Freebie Finding Mom’s Freebies Pinterest board. You may wonder why I’ve placed so much hope in a free potty chart. Here’s the thing…simply promising your child something may work for a one-off task but when you need your child to consistently perform the task (such as using the “big boy” potty every day) you need to get them excited about it. 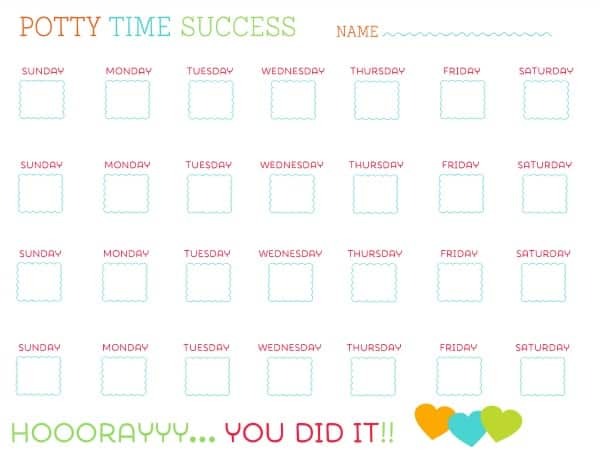 Allowing your child to track his or her progress (such as with this free potty chart) is a great way to do that. 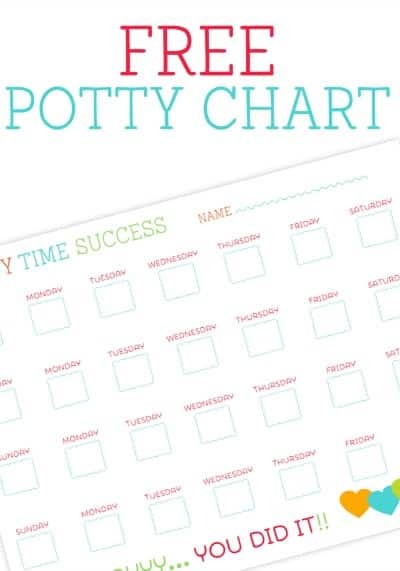 Your child can use special stickers or markers to check off days on this free potty chart. What makes a day successful? You decide! Since this is a blank free potty chart, you can change goals to fit your child. For example, when your child is first learning to use the potty, the goal might be to simply use the potty instead of a diaper. If your child successfully uses the potty during the day, he or she gets to check off a box on the free potty chart. Later, as your child becomes more skilled, maybe the goal is to unbutton their own pants or remember to flush or wash their hands. Check, check, and check on the free potty chart! Consider writing little incentives at the end of each week on this free potty chart. For example, if your child gets to check off each day for a whole week they earn a toy or a special dessert. Seeing the words there, waiting for him or her at the end of the week, can help motivate your child. Lastly, when using the free potty chart, make the act of marking off a day a big deal. Make it fun and exciting. Not only can this free potty chart help your little one learn to use the “big boy” (or girl) potty but it can also help him or her learn about setting and working towards goals. Have you used a free potty chart before? Please share your experience in the comments.